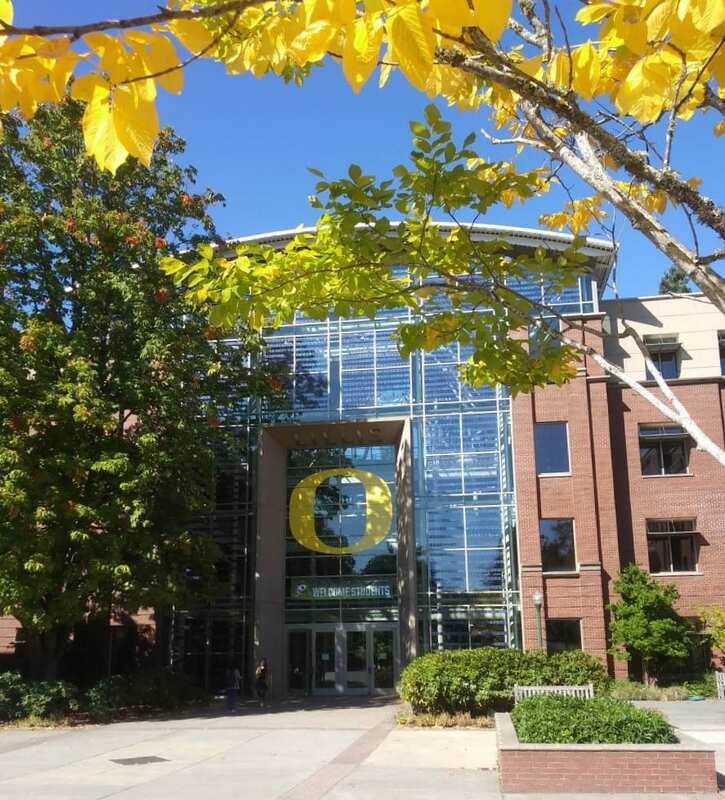 This post will NOT give you the typical information that you can easily find online about the LTS program or the University of Oregon. 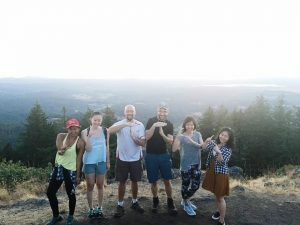 For me, as a current international graduate student in the LTS program, what I have experienced in the last month has been very different from what I thought it would be like. I remember the time before I joined the LTS program. I had read about the program. I had checked the social media, LTS blog, and the website. I had also seen pictures and videos of the campus online, but I admit none of them did full justice to how beautiful it truly is. When I visited the university campus for the first time I was wowed by how amazing it looked. 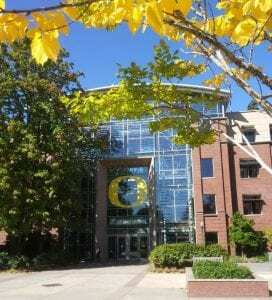 I am very happy that I got the chance to be in this program and at the University of Oregon. 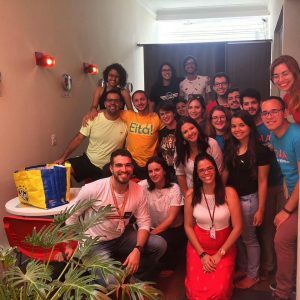 Therefore, I want to share my experience with you, and I hope it will help you know this beautiful university and this unique program better. 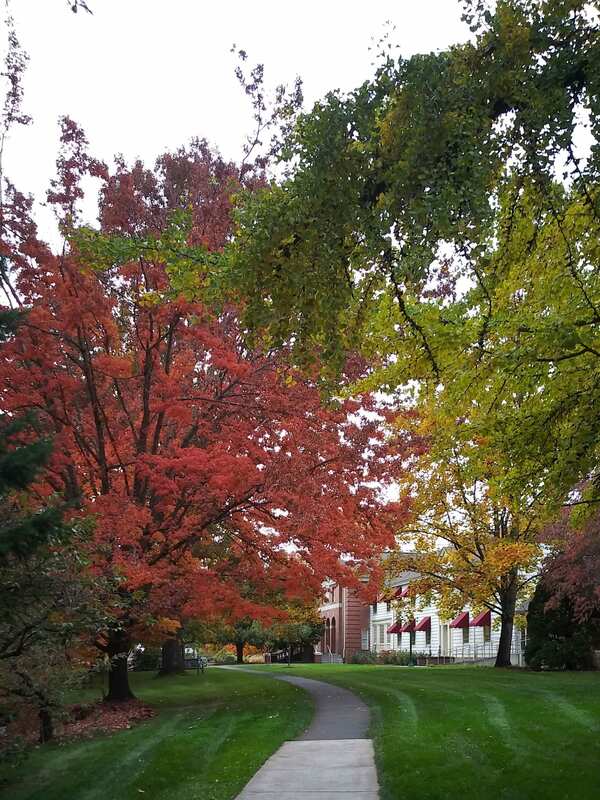 The first thing you will notice on the campus is the variety of trees and their beautiful colors in the fall season. 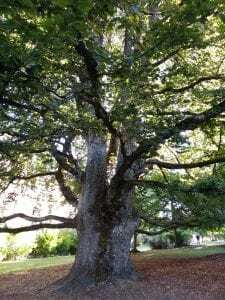 There are lots and lots of trees such as: oak trees, hazelnut trees, walnut trees, and many trees I don’t know the names of. Other than trees there are also a lot of friendly squirrels that live on the campus and sometimes peek into your classes. There is a friendly one living around Friendly Hall where the LTS classes are usually held and according to one of our professors, he is named Harry! The picture below was taken outside our class at Friendly Hall. I usually spend my class breaks sitting on those benches and enjoying the sun. These benches can be found all over the campus. 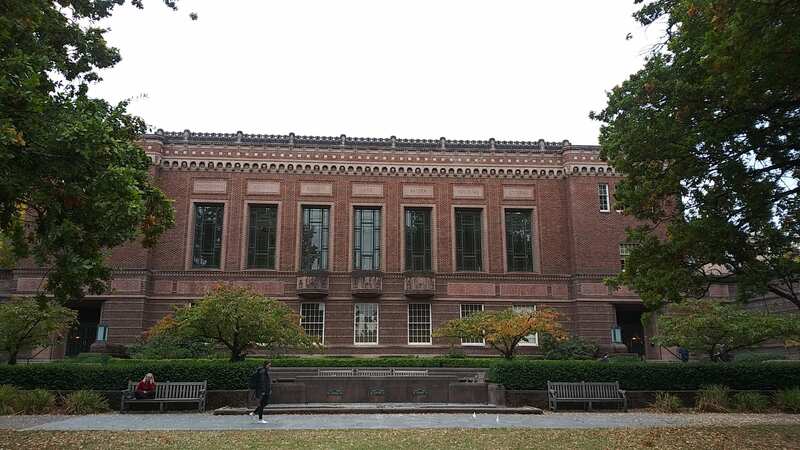 Another great thing about the University of Oregon is its library. It is a great library for nerds like me. There is a huge sitting area on the first floor where you have access to computers, printers, scanners, and reference books. There is also free internet access. There are literally millions of books available to read, and there are also plenty of sitting areas provided. In the basement there’s a café, so you don’t have to go without your caffeine. I personally like the UO library very much. In the picture you can see how big the building is. 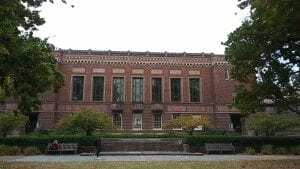 The library also has a website where you can find almost any book or article you are looking for. Agate Hall is home to the American English Institute (AEI) and where some of our classes are held. It is a beautiful building surrounded by beautiful trees. It truly is a hall for languages. When you go in, you see students from many different nationalities and can hear very different languages spoken. Sometimes I just go there, sit in one of the study areas provided for the students, and just enjoy the environment. If you are an international student and need to improve your English, AEI can help you. 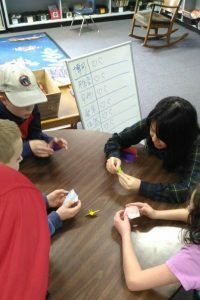 Fortunately, we have one of our classes at the Yamada Language Center (YLC) this term. In this center, languages other than English are taught. 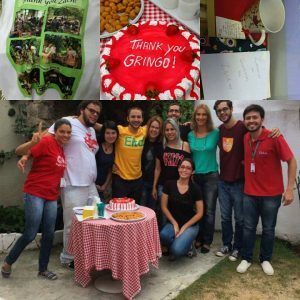 It is a very welcoming environment for students to learn other languages. The Center is located in Mckenzie Hall and has very high tech classes. 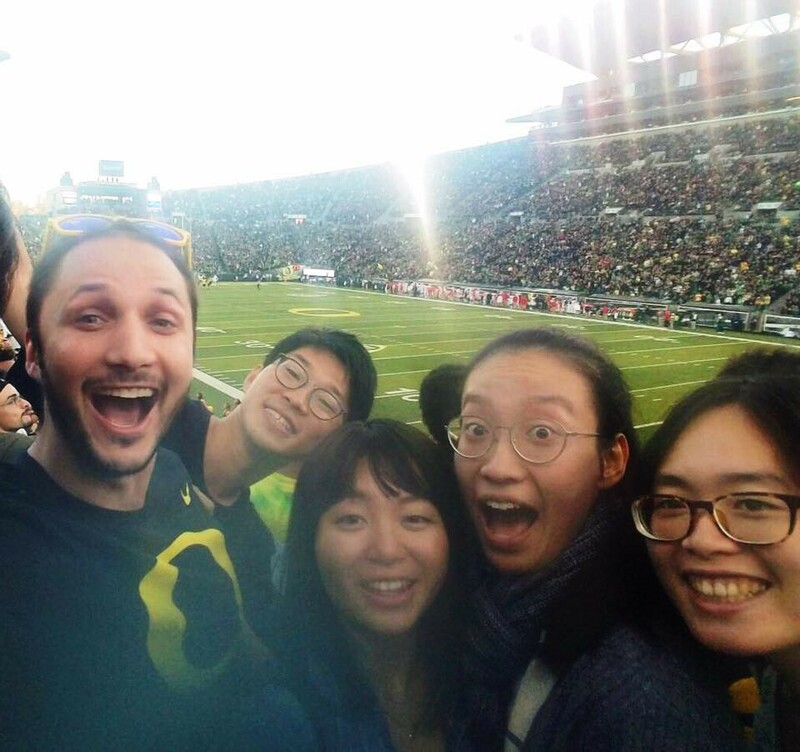 The Yamada Language Center works with a number of language departments at the University of Oregon and also has classes for less commonly taught languages such as Russian, Arabic, Persian, and Swahili. Last but not least, I would like to talk about the academic aspect of the LTS program and its faculty at the Department of Linguistics. While you are in the LTS program, you will benefit from the great LTS program curriculum. You will study about the theoretical aspects of language teaching and ways of putting them into practice. From the beginning, you will participate in teaching and will have many opportunities to observe language classes. Also, the LTS faculty are very knowledgeable, kind, patient, and open minded individuals. They have always answered my questions and have gone out of their way to help me with my problems. I personally am very proud and happy to be part of this wonderful academic community. This past Saturday, August 18, 2018, 11 incredible individuals felt the accumulation of 15 months or 2 years of hard word, perseverance, and knowledge building. Smiles, laughter, and tears of joy were seen throughout the ceremony. The two overarching themes for the day were inspiration and community. 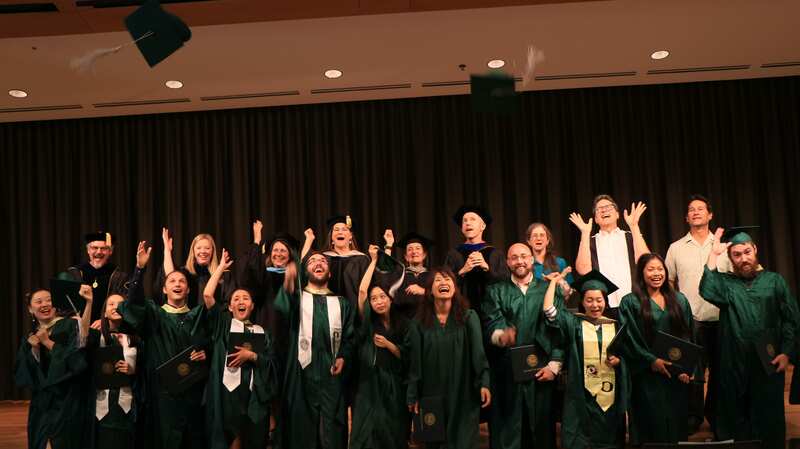 For inspiration, a quote from LTS director Dr. Keli Yerian’s commencement speech captures the beauty and complexity of language teaching: “Language learning is like a 4-dimensional puzzle that you live inside while you are solving it”. 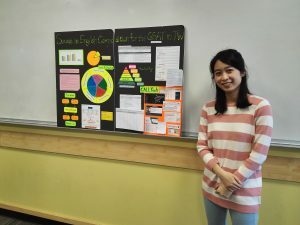 As the graduating students saw in their classes, helping students learn a language is not always a simple if>then formula; rather, each students is on their own journey with every new word, text, and social interaction. It is then teachers who help facilitate students’ understanding of these complex puzzles and help them feel empowered to want to continue to solve it. For community, the graduating students will be dearly missed, but the good news is they are forever part of the LTS family. 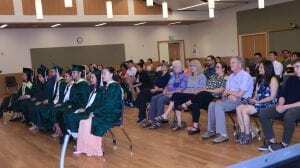 As LTS faculty member Laura Holland said in her speech to the graduating class, “Welcome to the family.” By this she means the LTS family but also the family of language educators and leaders. 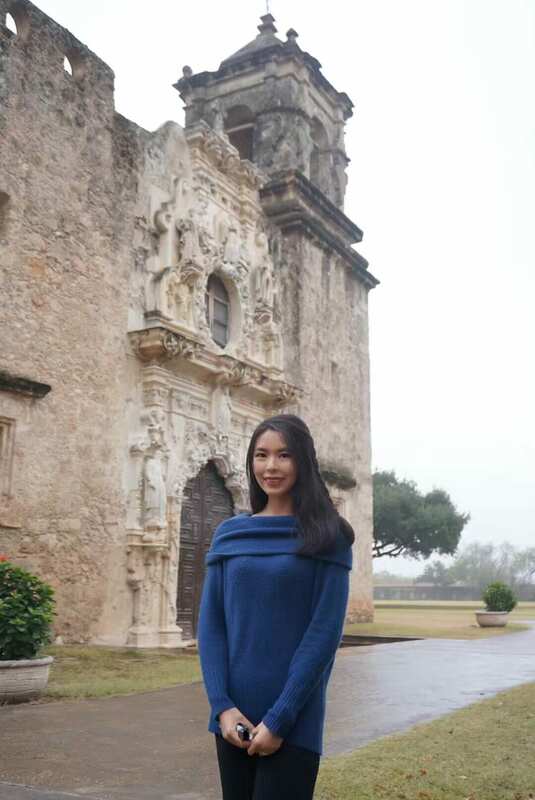 The final piece of advice comes from 2017-2019 LTS student Shayleen Eaglespeaker who says it is important to stay true to yourself and who you are. “Don’t be afraid to be different. Each person is coming from a different background and has a point of view that can offer a lot to your peers, so my advice would be to embrace that!”. Her words apply to the entire family, as this individuality and mix of backgrounds is what makes the LTS program so special. Congratulations again to those who graduated and best of luck to those who are just getting started. May you forever continue learning, challenging yourself, supporting your colleagues, and following your dreams. 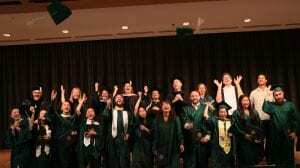 Pure elation from the 2018 LTS graduating class and LTS faculty members. This summer term we are highlighting the final M.A. 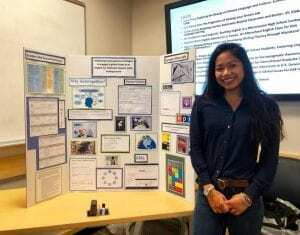 projects of the soon to be graduating LTS cohort members. 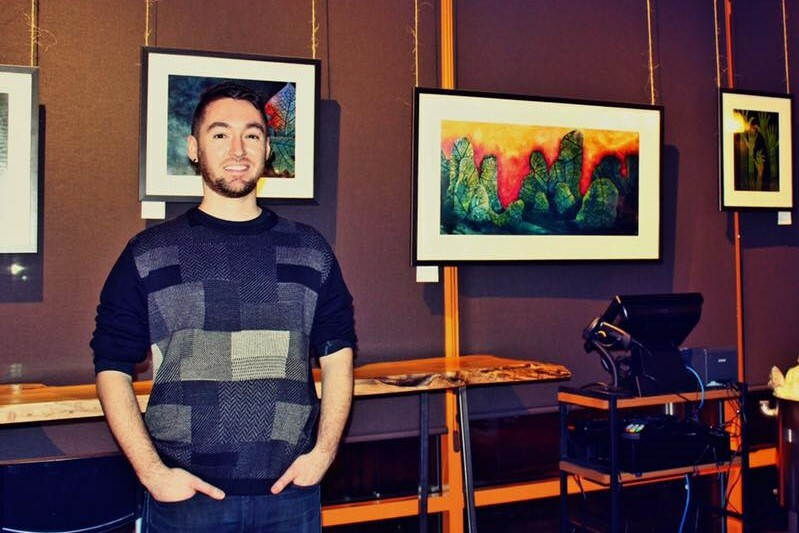 This week we are pleased to feature Alexis Busso and Lee Huddleston. Alexis presenting her initial course design at the LTS poster session. Hi Alexis! What is your M.A. project about? My M.A. project is a course design about employing metacognitive strategies in a writing course. The proposed course design is an intensive writing class where writing genres are supplemented by global issues topics. The focus of the project is for students to engage in academic writing while learning about different issues both on a local and international level. I became interested in this topic for a variety of reasons. In the lesson planning class that we took in the Fall, I wrote a research paper about metacognitive strategies and that is when I was first introduced to the study of metacognition. Furthermore, my undergraduate study was in International Studies and this field has had a profound influence in my worldview. My M.A. project is a combination of my interests and passion. 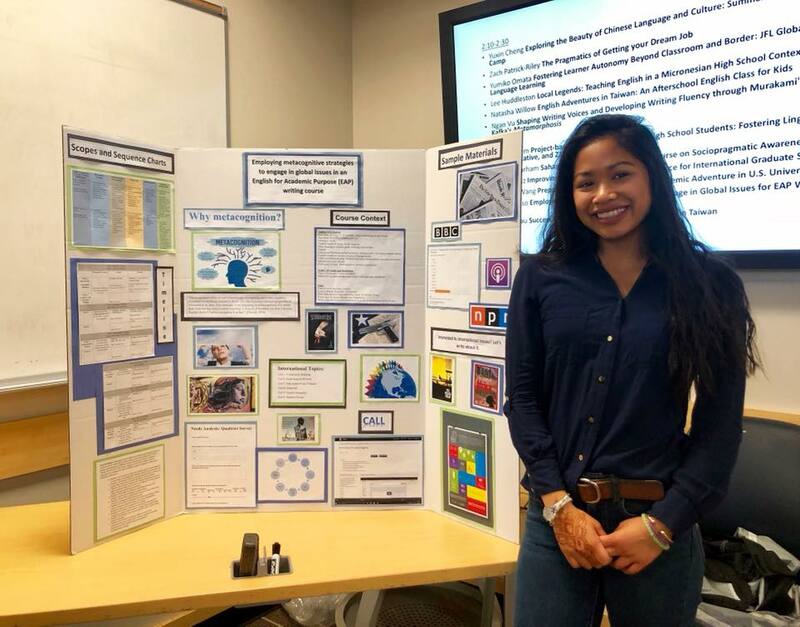 The most interesting part of my project is that I think it is the only project or one of the few which delves into other fields of study beyond education, foreign language learning, second language acquisition, etc. Moreover, although other students are focused on writing skill, mine is the only one that uses international topics as themes/subjects. Yes! Floating down the Willamette river is a must and endless hikes. I also have plans to go blueberry and strawberry picking and spending lots of time outdoors. Hi Lee! What is your M.A. project about? My M.A project is a teaching portfolio around the use of local legends as content in English language classrooms in a Micronesian high school context. This teaching portfolio will be designed so that the materials can be adopted or adapted to fit similar contexts. Using legends as content will provide students in isolated contexts with motivating materials that they can then connect to their own experiences, and use such texts to build their academic skills in areas of reading, writing, speaking, and listening. 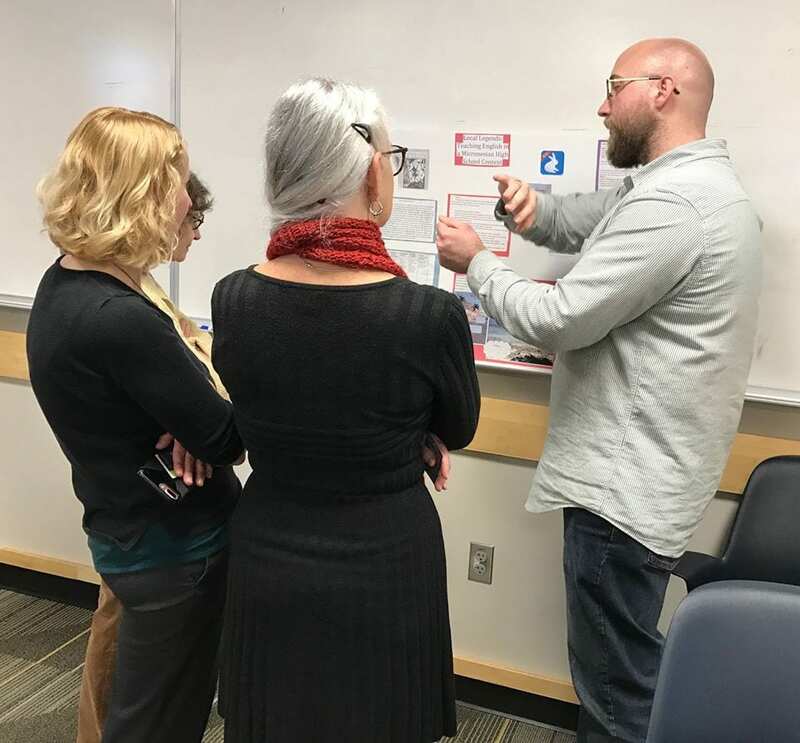 The activities and lesson plans in the portfolio would focus on areas of language, culture, and experiential learning to use the materials to their fullest. As I previously mentioned in this blog, I served in the Peace Corps as an English teacher in Micronesia for over 2 years. During my time in Micronesia, I became very interested in the local legends and stories of the islands. 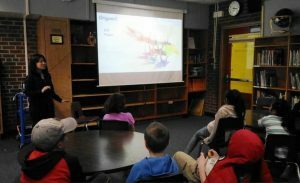 I also observed the challenges in education that the islanders face, and I drew the conclusion that using local legends rather than American English Language Arts textbooks would be beneficial to students in terms of utilizing their interests and prior knowledge to help them engage with English at a higher and more creative level. 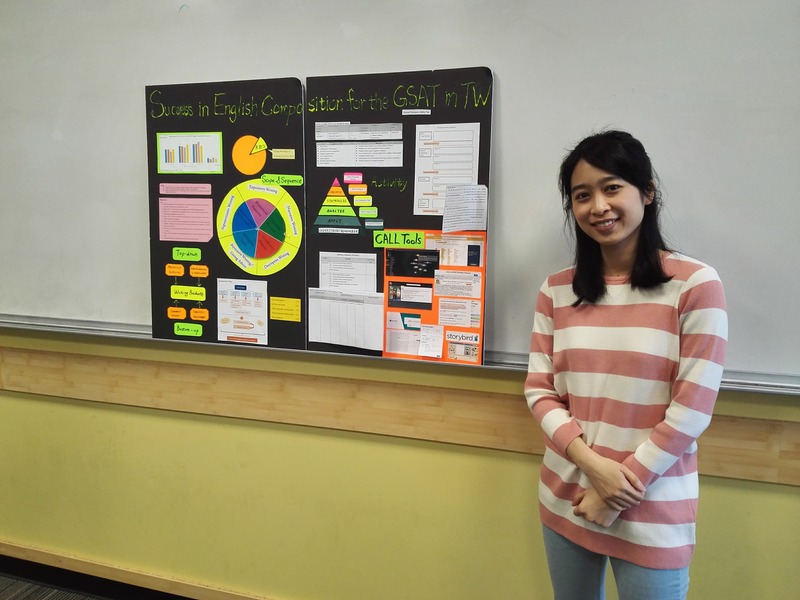 I would say that the most interesting part of my project is the fact that it provides a bridge for learners by connecting their culture with English; giving value to their culture rather than presenting English as an identity that they must adopt in order to be speakers of the language. 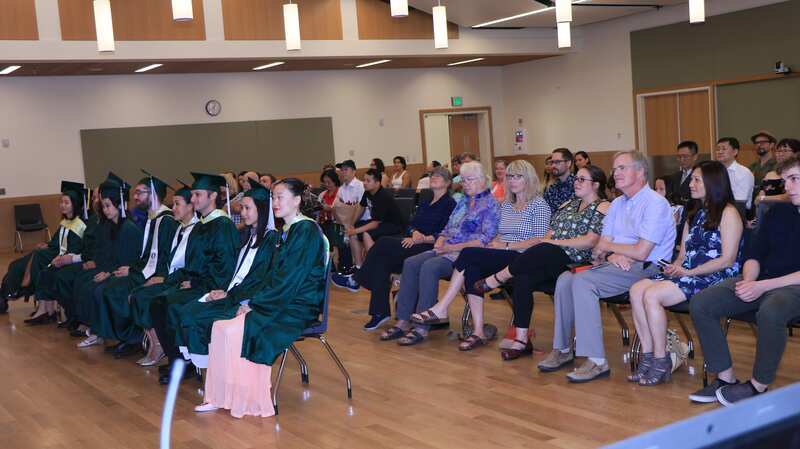 In the Micronesian target context, dependence on the United States is an issue that cannot be ignored, and changing pedagogy to be more empowering to students is an important first step. I want to take a more balanced approach to this term. Making room in my schedule to hike, exercise, and relax will all be essential as I finish this program. Maybe I’m a bit ambitious, but going to more music venues, and eating out at a few places I’ve been wanting to try are some other bucket list items. I am from Eugene, so my bucket list for my hometown is rather small at this point. 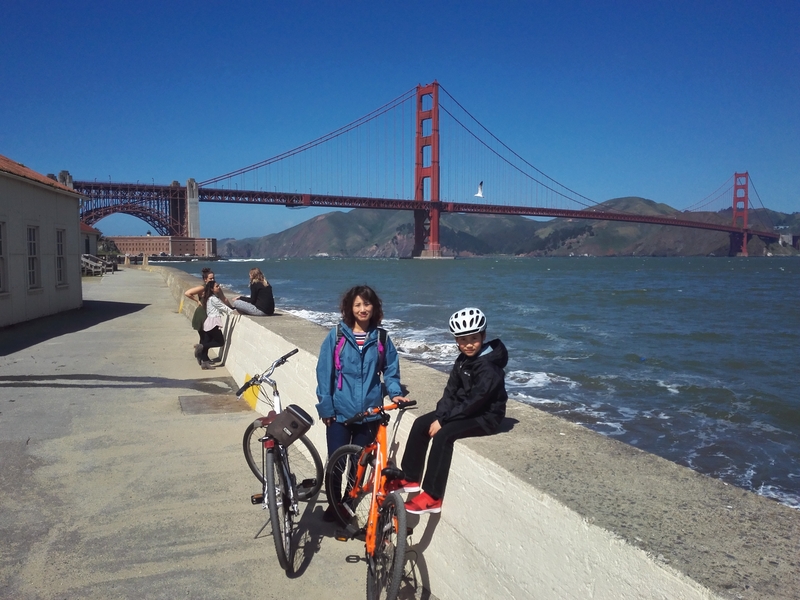 It is pleasure to introduce you to LTS student Kunie Kellem! 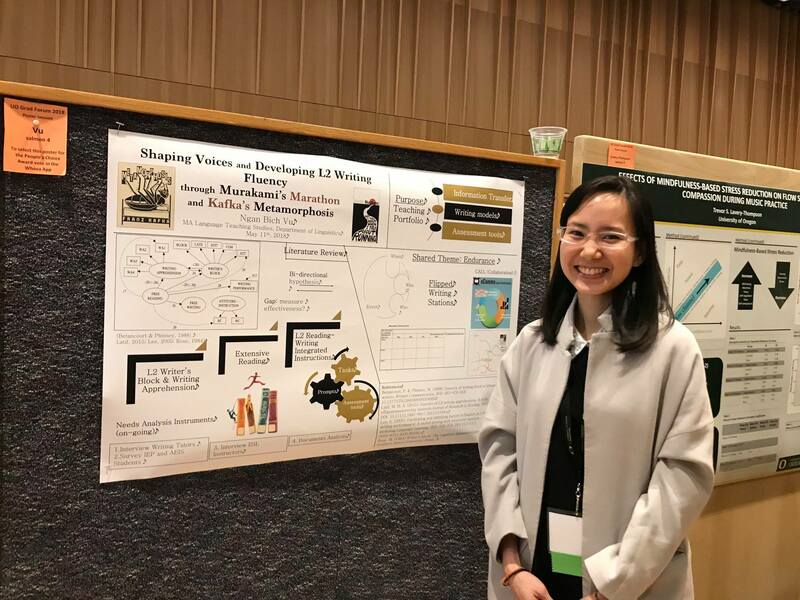 Kunei presenting at the LTS poster session. Hi Kunie! Please tell the world a little bit about yourself. Hi. I’m Kunie! I’m from Osaka, Japan. I like running, working out, playing and watching basketball, and eating delicious food!! 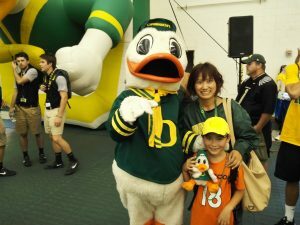 I came to Eugene with my husband and son in August 2016. 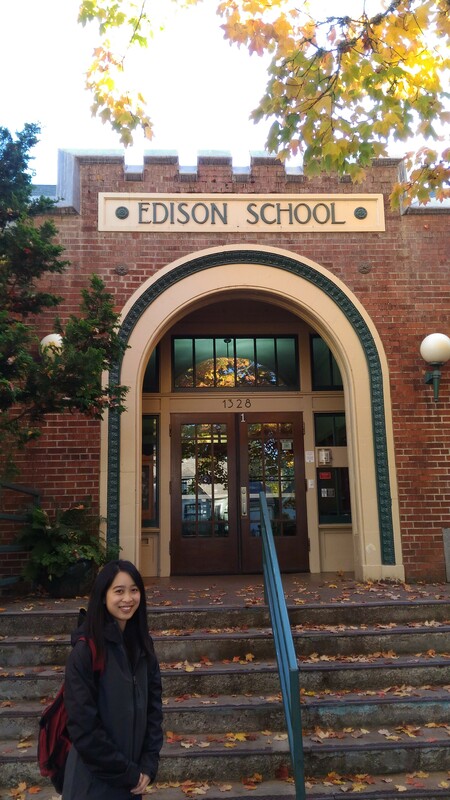 Before I came to Eugene, I taught English at Japanese high schools for 14 years. 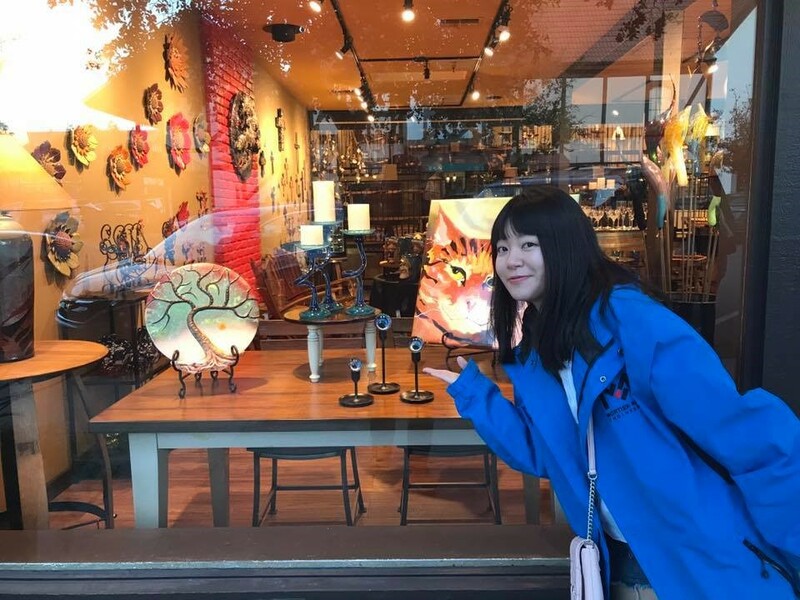 I loved my job, students, and my coworkers, but I was always struggling with this dilemma between ideals and reality of English classes in Japan. I wanted to change something. I wanted to see my students communicate in English confidently. I wanted to have confidence in my skills and knowledge to support students to realize their goals. That is why I decided to study in the LTS program!! Kunie with her son and Puddles the Duck. Well, we sure are glad you made that decision! So how has the LTS experience been for you? 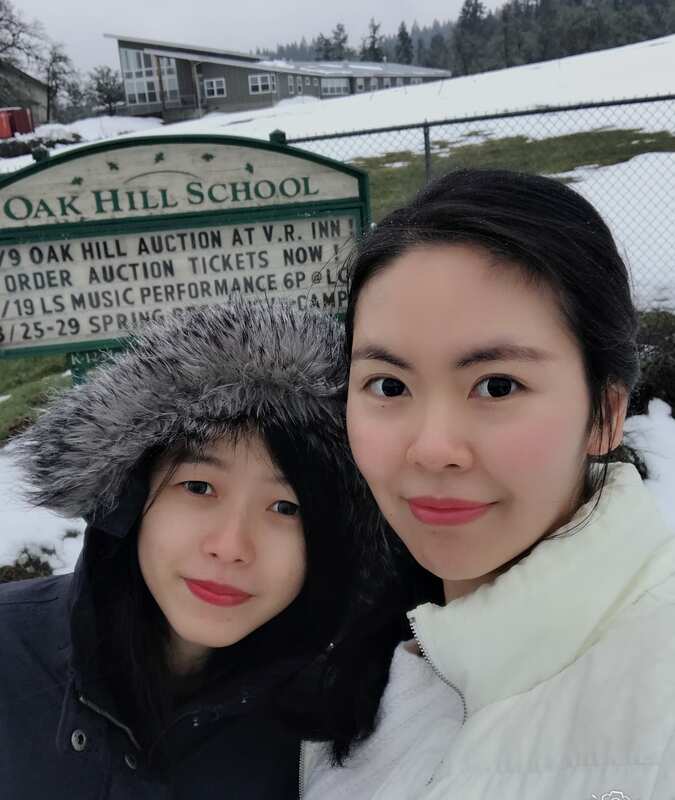 It was a big decision for me to come to U of O to study since I had to leave my work, and my family had to change their life styles dramatically. What I was most worried about was my son; if he could adjust to the life in U.S., if he could get new friends, and if he could improve his English to keep up with his school work. I was not so worried about myself at the start point of my new journey. However, it turned out the first 3 months here were the hardest time in my life. Since it had been for such a long time after I graduated from university, everything was new and different. I was surrounded by young, enthusiastic students who were always actively involved in discussion in class, whereas I, who was not used to discussion style lectures, was always at a loss about what to do. Being an international student made things more difficult. 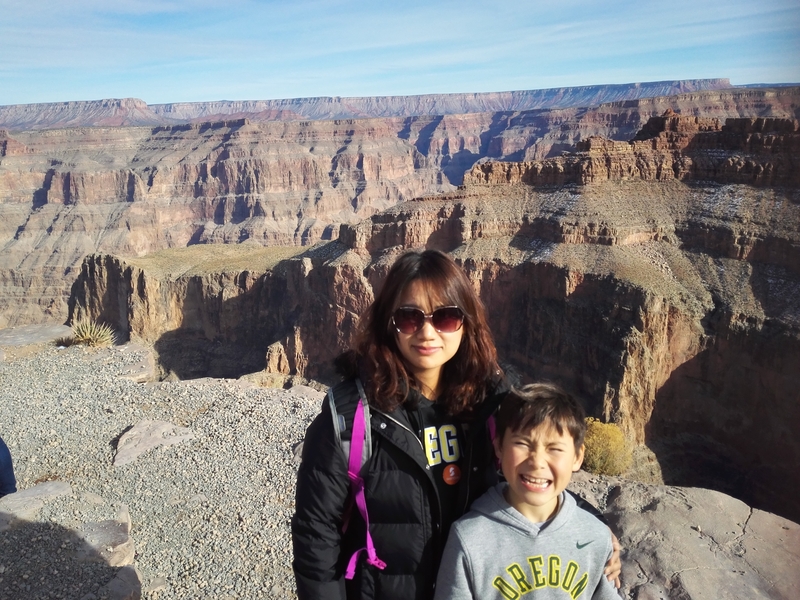 Kunie with her son at the Grand Canyon. I still remember for the first few weeks I woke up at 4 o’clock in the morning to work on my reading, take notes, review the lecture notes, and prepare for the classes. In addition, as I had expected, my son also had a hard time at his new school because of the cultural and language issues, which made me feel terrible and responsible for taking him all the way here with me. I literally cried a lot for the first few months. However, things started to get better after 3 months. 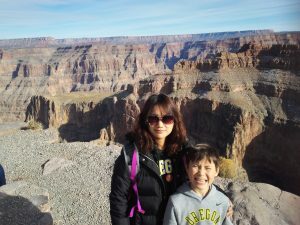 My son started to enjoy his school life and made many friends. (At first, he could not read English, but now he is in the advanced spellers group!!) My husband finally got a job here. I gradually got used to student life here. After that “dark time” passed, I started to enjoy my life here more. I started to hang out with my friends more, go hiking more, go to watch Duck’s games more, which made me realize that Eugene is such a beautiful place surrounded by great nature and great people. I don’t think I could have gone through this far without support from my family, friends and professors at U of O and I am so grateful about it!! 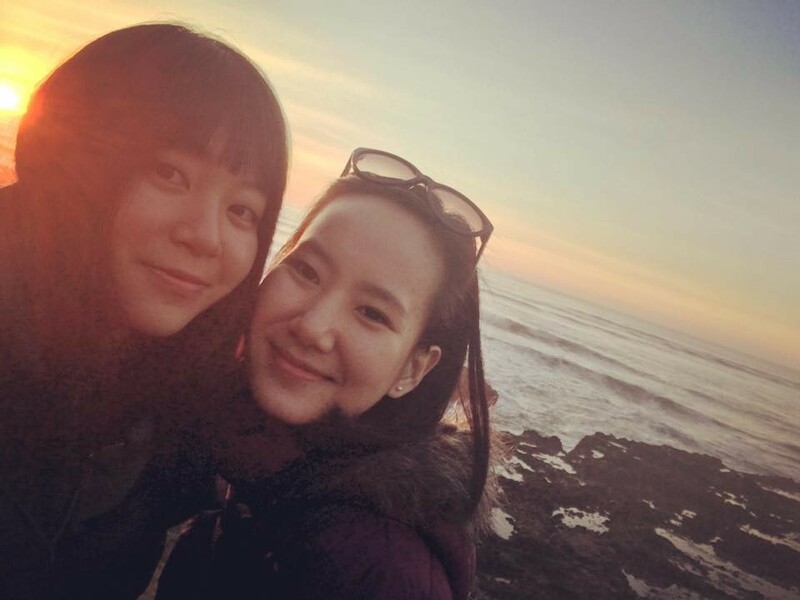 Kunie with LTS friends Aska (2017) and Krystal (2018). 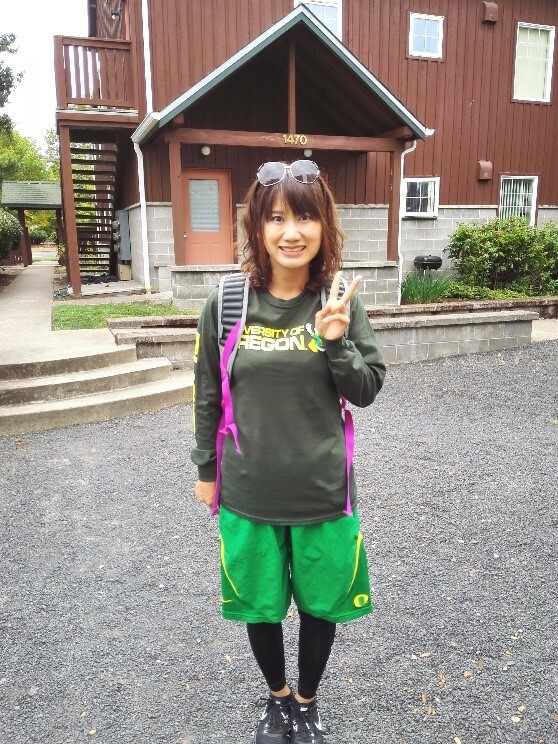 Kunie in her UO duck gear. Glad to hear you and your family made it through that transition period and grew from it! What are some key things you’ve learned in your time here? Of course, I have been learning very important principles and pedagogy of language learning and teaching, but at the same time I really appreciate that I get the perspective of how it is like being a student and learning new things again; what students think, what they struggle with, and how they deal with learning. I almost forgot those perspectives, and I am sure this experience will help me to become a better teacher when I go back to my work. 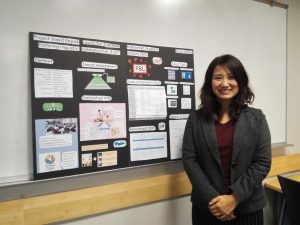 Also, I have learned from my professors how to create the comfortable atmosphere to learn, how to support students, and how to assess students’ learning based on objective-based assessment, which is very motivating. I would like to incorporate what I learned here into my teaching!! And I know you have been teaching Japanese, how has that experience been? 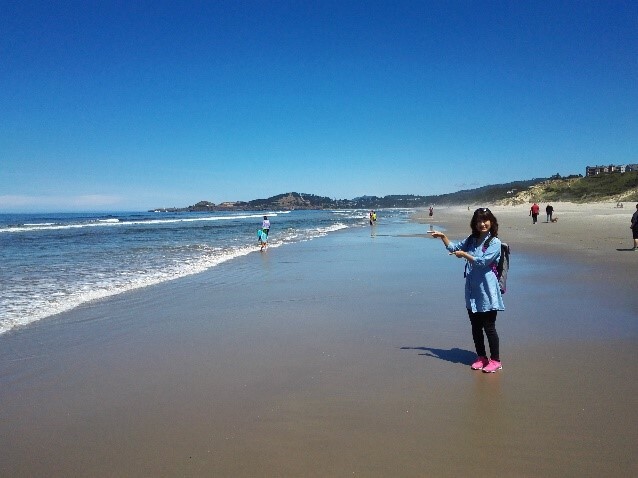 Kunie at a beach in Newport, Oregon. Yes. 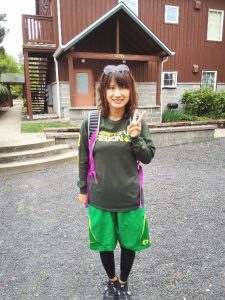 I have been working as a Japanese GE at U of O for 6 terms. I really enjoy teaching Japanese and I like when the students show me “aha! moment” expressions when they understand and use the structures well in a communicative practice. One time, at the REC center I bumped into a student whom I taught before, and he gave me a high five and talked to me in Japanese. I felt extremely happy!! I think this is one of the (rare) rewarding moments for language teachers. 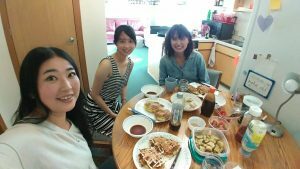 Teaching Japanese has also given me a great insight about language teaching. 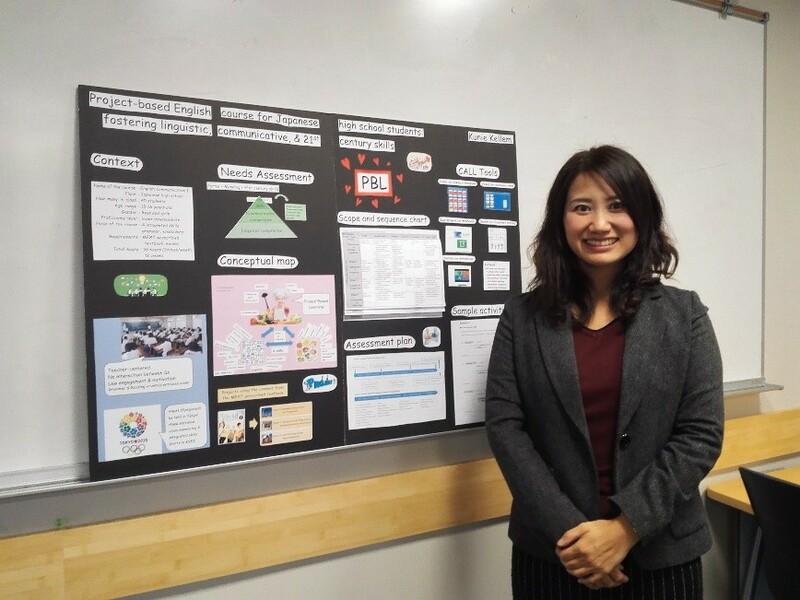 Although Japanese and English are two different languages, I am learning a lot about teaching techniques, curriculum designs, assessments, and classroom managements from Japanese instructors and actual lessons. Now I can see Japanese language and its culture from a different perspective, which I am sure will be a great asset of mine when I go back to Japan. 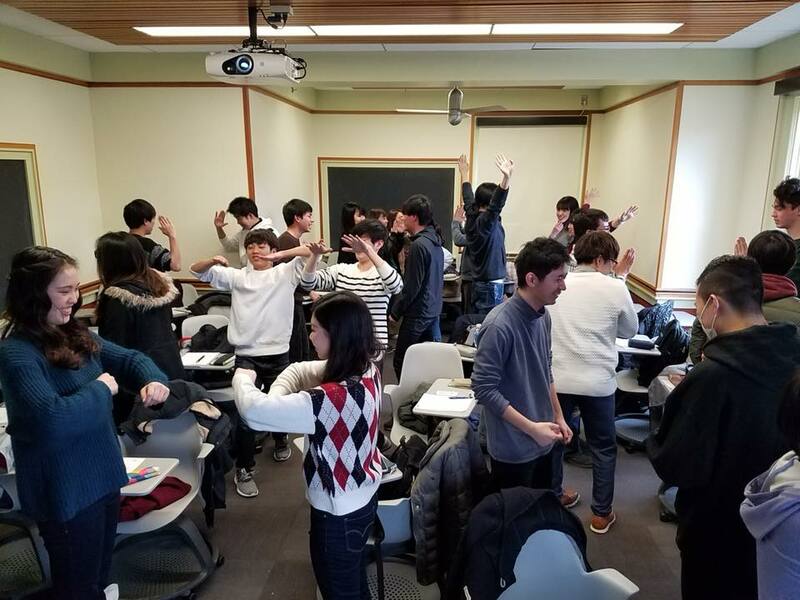 I appreciate that I was given this opportunity to teach Japanese here. Are you excited to have started working on your M.A. project? Yes! Actually, I have been worried about it for a long time, but once I started writing literature review for MA project, I really enjoy it. Since I am on the two-year program, I could spend more time thinking about my project than many of my cohorts who are on the 15-month program. On my first year, I spent most of my time, energy and effort on just doing well in a class. However, after one year passed, many things I learned from each class started to make sense, and they started to be connected with each other. Kunie with her son biking around the Golden Gate Bridge. Now I feel like I am working on puzzles; a small puzzle for literature review and a big puzzle for MA project. I will keep reading and learning from professors and cohorts to find the best pieces for my puzzle. I am really looking forward to seeing what kind of picture my puzzle will turn out to be. What a nice connection between the final project and puzzles! Any final thoughts? I know most of my LTS cohorts live busy stressful days with a lot of school work. I also feel the same way. Although it is very important to be organized and work hard on our project, sometimes it is also important to release our stress by doing/eating what we like. We are now 4 months away from the end of our journey. I am sure it is going to be busy and hard 4 months, but we are on this together. I hope each of us can see our own beautiful picture on the puzzle at the end of this journey!! Thanks so much for taking the time for this interview and best of luck in your completion of the program! It is my pleasure to introduce you to 2017-18 LTS student Zach Patrick-Riley. 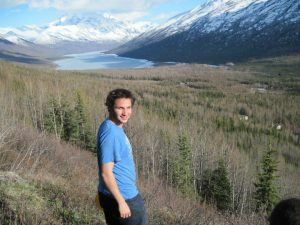 Zach enjoying the Alaskan summer. Hi Zach! Please tell the world a little bit about yourself. Hi! Oi! Hola! My name is Zach Patrick-Riley and I am originally from Anchorage, Alaska. I did my undergrad at Lawrence University in Appleton, Wisconsin (Go Pack Go!) and while there I discovered the joy of traveling when I studied abroad in London, England. Since that first time abroad, 2008, I have been to 38 countries around the world. People often ask what my favorite place is and it’s an impossible question… with that being said, Brazil is like a second home to me. Zach representing the Pernambuco, Brazil state flag. 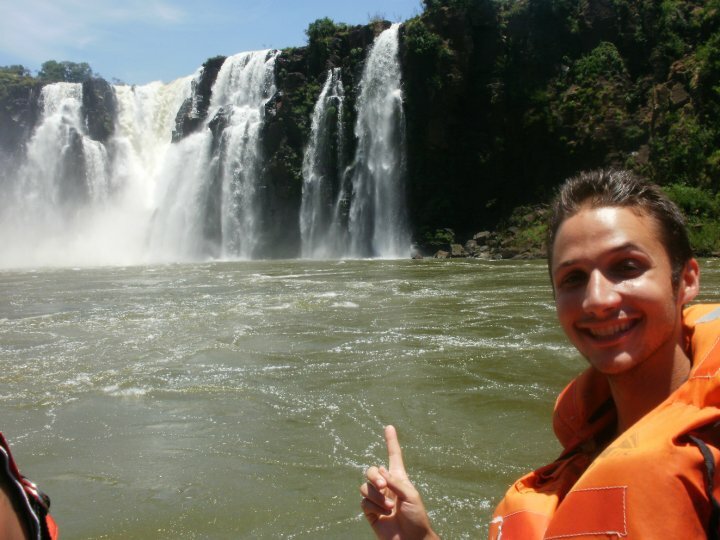 Zach enjoying a waterfall up close at Foz de Iguazu, Brazil. Halfway through my senior year of college, I was still deciding what to do after graduation. Fortuitously, I attended a weekend workshop that my university put on about diversity on campus. The first night I was quite tired, but I saw a group of students sitting by a fire. I decided it was as good a time as any to branch out and meet some new people. Thankfully I did because I soon started talking to a student from Northeast Brazil, Gustavo. We got along right away and he asked me what my plans were for after graduation. Long story short, he put me in touch with the owner of a school in Brazil, Junior, who invited me to come teach there after graduation. 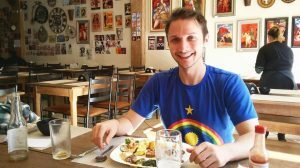 At the time, I didn’t really know anything about Brazil but it seemed like quite the adventure (I didn’t even speak any Portuguese!). 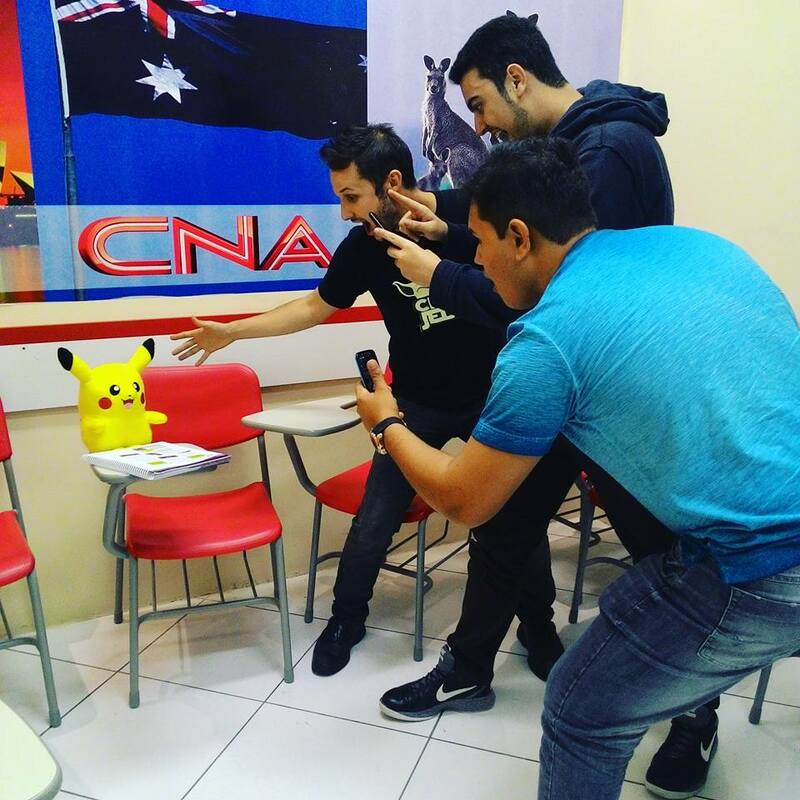 Zach with a couple Brazilian students and Pikachu. Zach with a group of teachers/friends he trained in Brazil. I was quite nervous before the first class and wasn’t sure if I would even enjoy teaching. That all changed the minute class started. Do you know those moments in life where something just feels right? Well that’s how I felt about teaching. On that very first day, the energy in the classroom spoke to me on such a deep level and it has continued to do so ever since. 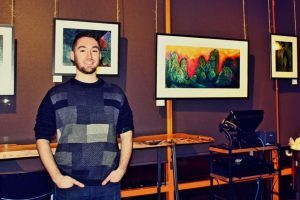 After spending six months teaching in Brazil, I returned to Alaska and from 2010-2014 I did a combination of substitute teaching and working in the art department on various commercials and movies (e.g. Big Miracle). I loved the flexibility that the jobs provided as I could work hard for a bit and then go travel to different parts of the world. In 2014, I decided to commit even more to language teaching and got my CELTA (a TESOL teaching certificate) before returning to Brazil to teach/do teacher training for 2015-2016. 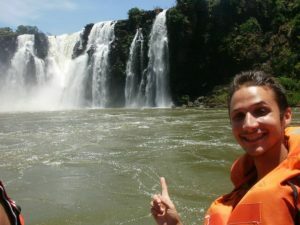 My second time over there just reaffirmed my love for language teaching and Brazil. Zach at a farewell party with his fellow teacher friends in Caruaru, Brazil. Quite the story! Was your journey to LTS as serendipitous? 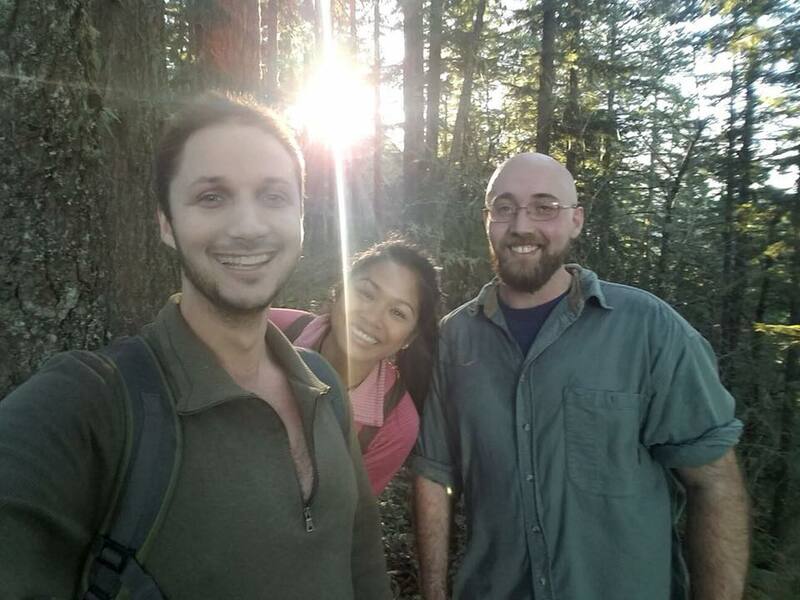 Zach hiking with LTS friends Alexis and Lee. 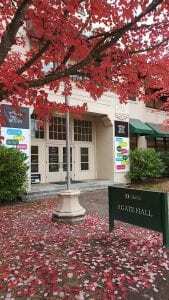 It’s quite the story as well, but to sum it up: After returning from 2.5 years working and traveling in South America, I went to the 2017 International TESOL conference in Seattle. During the conference it became apparent that in order to get the kind of premium jobs I wanted, a Master’s degree was essential. Right after that realization, I attended a workshop and met a graduate student in the LTS program, Devon Hughes. She spoke highly of the program and mentioned that the director of the program, Dr. Keli Yerian, was actually downstairs. I didn’t want to impose, but am glad I got past that because talking with Keli and other LTS faculty and students who were there inspired me to apply. I got my application ready as soon as the conference ended and now here I am one year later. So how has the LTS experience been for you? The experience has been life-changing to say the least, both personally and professionally. Succeeding academically in this program has meant the world to me on a personal level and really built up a lot of academic confidence that before was lacking. Everything we learn in the program directly benefits our future teaching endeavors. It is very hands-on so you get to mould your learning to suit your individual interests. Zach doing a workshop on VR/AR and language learning which fellow LTS friend Logan Matz seems to be enjoying. For me, what really makes LTS special is the community with the cohort and the professors. Everyone is so supportive and encouraging, while also making sure we each achieve our maximum potential. The professors treat us with kindness and respect, valuing and encouraging our contributions in the classroom. The professors always take the time to talk to students after class. I am forever grateful for the guidance I have received from my fellow cohort members and professors, as well as the smiles and laughter. I know you work as a GE (graduate employee) at CASLS. What has that been like? I know it sounds cliché, but CASLS has been life-changing as well. Just like the LTS community, what really makes CASLS so special is the energy. Every day I am inspired by the collaborative and innovative values to which CASLS subscribes. I have the supreme pleasure of working with LTS faculty member Dr. Julie Sykes, who has shifted the way I see communication due to pragmatics, and Stephanie Knight, who has greatly enhanced my efficacy with curriculum design and article writing. 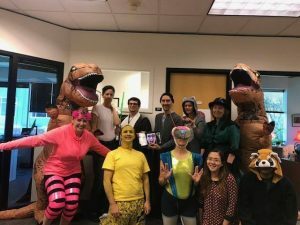 The superlatives continue as the rest of the people at the CASLS office are equally amazing and brighten my every day, even in the most stressful of times. Zach with CASLS colleagues enjoying Halloween. In terms of projects, there have been quite a few I’ve worked on. The biggest one is LingroToGo, a new Spanish language learning mobile application that promotes authentic language use, and dynamic game-based language learning. For this app, I have created a number of the animated videos, some video scripts, and done quality assurance testing. It is fantastic to be even a small part of a resource that, in my opinion, exemplifies the direction quality language teaching is heading. 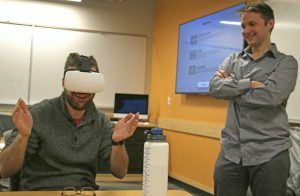 Another project is writing articles for the online language learning newsletter Intercom, which offers cutting-edge research and ready-made classroom activities. This experience has allowed me to author publications that reach thousands of national and international educators. 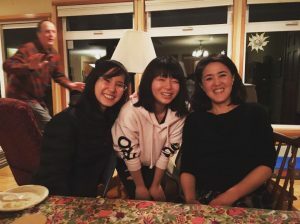 During Winter term, I also worked with a group of visiting Japanese students from Nagoya, University, and as always, it reaffirmed just how wonderful it is to be in the classroom. I love that I get to be an integral part in the planning and implementation of all kinds of cool programs. Zach doing a workshop on pragmatics with students from Nagoya University. It sounds like it! Last question, are you excited to have started working on your final MA project? I am indeed. It is a little daunting as time is flying by and we will be presenting before we know it… but when you love what you are studying/working on, it makes it fun and exciting. My project involves pragmatics, pronunciation, and individualized learner instruction. Sim (yes in Brazilian Portuguese). The world responds when you take chances and put yourself out there. I was nervous before I talked to Gustavo at that workshop, or when I talked to Devon and subsequently Keli at the TESOL conference, and I was even nervous about applying to grad school and CASLS. As you read, they all ended up being positive life changing experiences and make me fill-up with emotion just thinking about them. 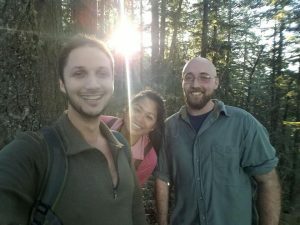 Often the most rewarding experiences are intimidating at first, but just believe in yourself and you will end up in the most wonderful of places, like the LTS program. 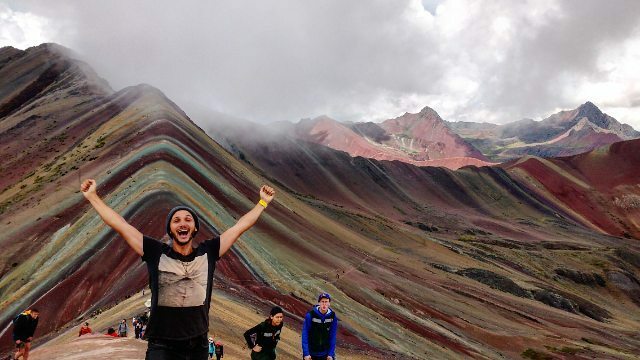 Zach at the summit of Rainbow Mountain in Peru. Thanks so much for taking the time for this interview! Best of luck in your completion of the program. It is my pleasure to spotlight current LTS student Krystal Lyau (2017-18). Krystal on the California Coast. I’m from Taiwan. This is my second year in the LTS program. I love fantasy. I can do nothing but finish a fantasy novel or a whole season of fantasy TV series in a day. I think that studying abroad is a fantastic and surreal experience too. We are so far from the world we are familiar with, and every day is such an adventure. It is like being granted another kind of life. For the first six months here, I always had this feeling that I was not sure which life was real, the one that I had left behind or the one I was experiencing at the moment. It is definitely a really scary but also exciting journey, like all the novels I have read. You’ve been in the program for a year and a half right…How has your experience been? Any particular highlights? What are some key things you’ve learned in your time here? I’m really grateful that I decided to be in this program. As an international student, the first half year here was the hardest. Not only did we have to keep up with the schoolwork like everyone else did, we also struggled a lot with the language, getting used to the academic environment here and overcoming other culture shock in general. However, the LTS program really made all these things much easier for us. The faculty and cohort have always been really supportive, sympathetic, and tolerant. I think the most important thing I have learned is to be critical but also open-minded about everything. Being in an environment with such a diverse culture and varied perspectives really broadens my horizons. It gives me an opportunity to think differently, and be more creative and liberal. And I know you were involved with the Chinese Club last term. What was that like? Krystal in front of Edison elementary school. It was a brand new experience for me since I have only dealt with high school students before. How to interact with students, to manage the class, to design a lesson is totally different from what I was used to. Last term was especially more challenging than ever, with such a diverse level class, including native speakers, heritage speakers, and novice L2 learners. Classroom management was quite demanding as well because of some students’ lack of learning motivation. Despite all the difficulties, I’m glad that we tried some new things to cope with the problems, like separating the heritage speakers and L2 learners, differentiating the materials, and developing some classroom management routines. It was really rewarding to see that we had finally made some progress. 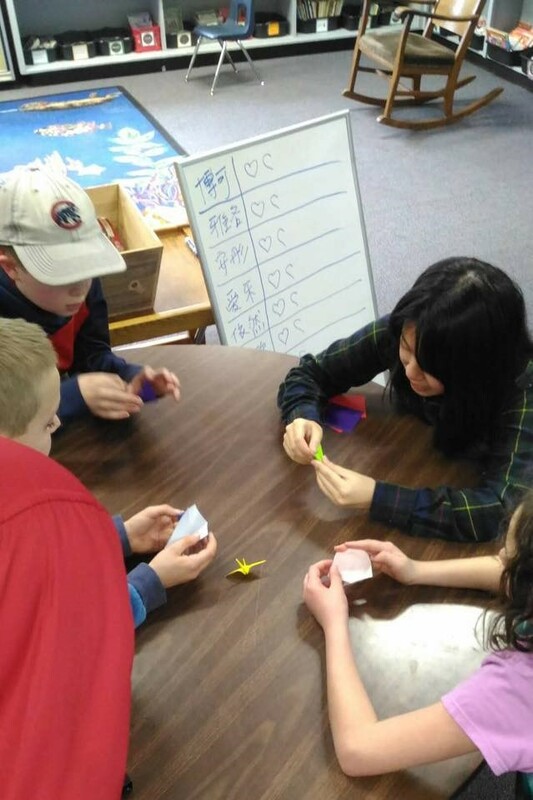 Krystal teaching students Chinese at Edison elementary school. 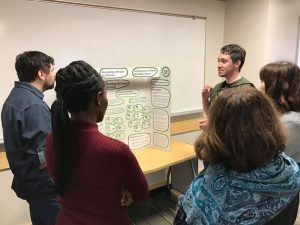 Are you excited to start working on your M.A. project? Yes, it is definitely both exciting and dreadful. I can’t believe I have made it so far and things are getting real now. 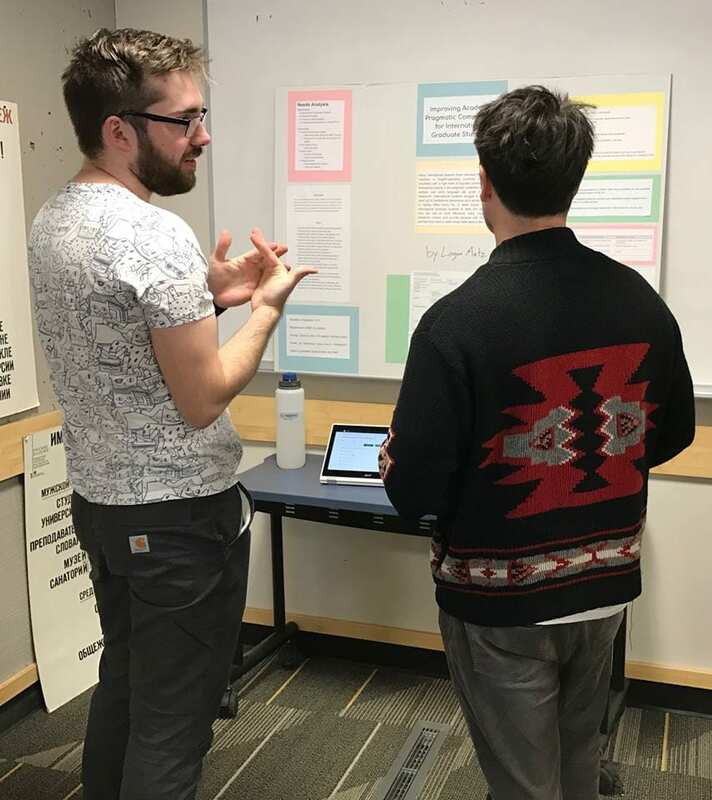 For my project, I really want to develop something that incorporates what I have learned and experienced as a learner and language teacher in this program. I hope it will be practical and creative. This is like the last chapter of my journey. It is undoubtedly going to be the most challenging part of the story, but I believe it will be worth reading. Krystal presenting her writing course for LT 548 Curriculum and Materials Development. I’m really grateful to have the opportunity to be here, thanks to all the support from my family, the faculty and cohort in this program, and my friends. I couldn’t make it by myself. The finish line is in sight. Good luck to all of us. Krystal enjoying a moment of relaxation. Thanks so much for taking the time for this interview! Hope you have a great spring term and finale to the program. 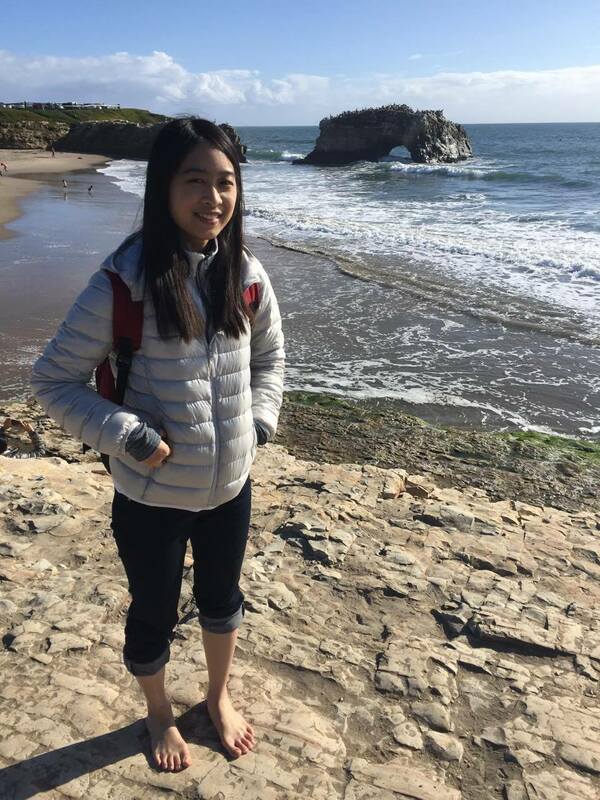 It is my pleasure to introduce you to 2017-18 LTS MA student Yuxin Cheng! 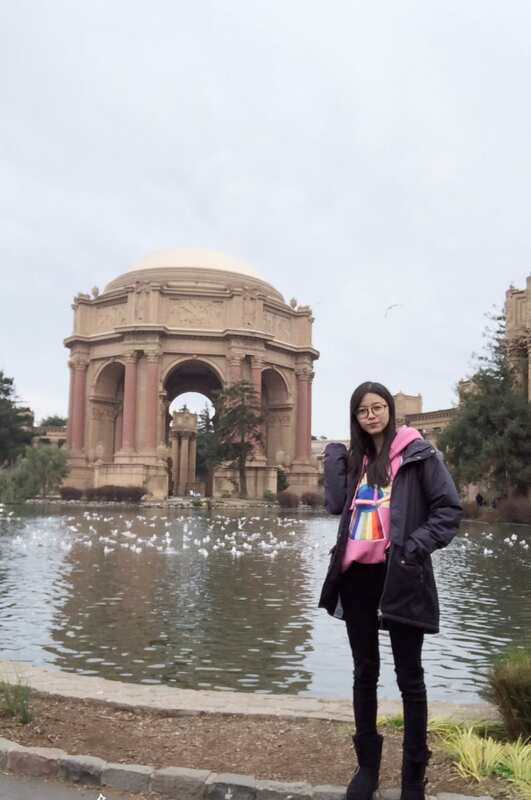 Hi everyone, this is Yuxin. I like traveling and all kinds of cute stuff. My undergraduate major was in Accounting, and then I was suddenly aware that I wanted to be a teacher due to my volunteer experience in a Chinese immersion elementary school in Salt Lake City, Utah. Have you been enjoying the LTS program? Yes! I like the courses I am taking and the internship I am doing. Although sometimes I feel a little bit “sad” since I hardly have any time to have fun with my friends, and only have classes, group meetings, readings and papers around my MA project. But I guess this is how my life is supposed to be as a graduate school student. My cohort is really nice; everyone is willing to share and help. I really like the learning environment in all the courses, and the positive energy shared among our cohort. I appreciate that I have the chance to be involved in our LTS family (people get together after classes to do things, which is really nice and warm). We are more than a cohort in the same program: we are also good friends in each other’s life. 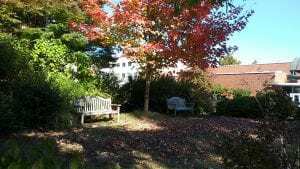 Our program’s faculty are all very kind and helpful as well, and they have been working really hard to offer us professional advice and provide help. What are you hoping to learn/gain from the program? I am hoping to become a professional language teacher. 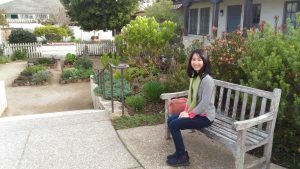 I started from zero in the language teaching field, but I found my passion in our program. I knew teaching would be my future career. 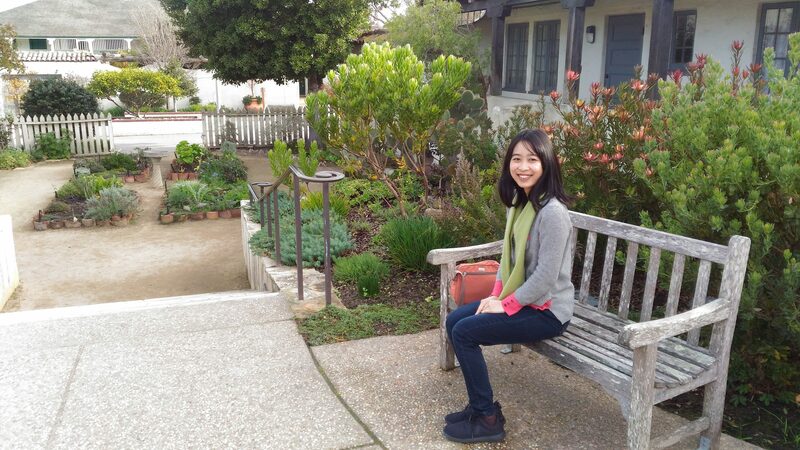 At the same time, I am hoping to have more chances to practice teaching in order to gain more experience. And I know you are involved with the Chinese Club. How has that experience been going? It has been a great experience for me, and a challenge as well. 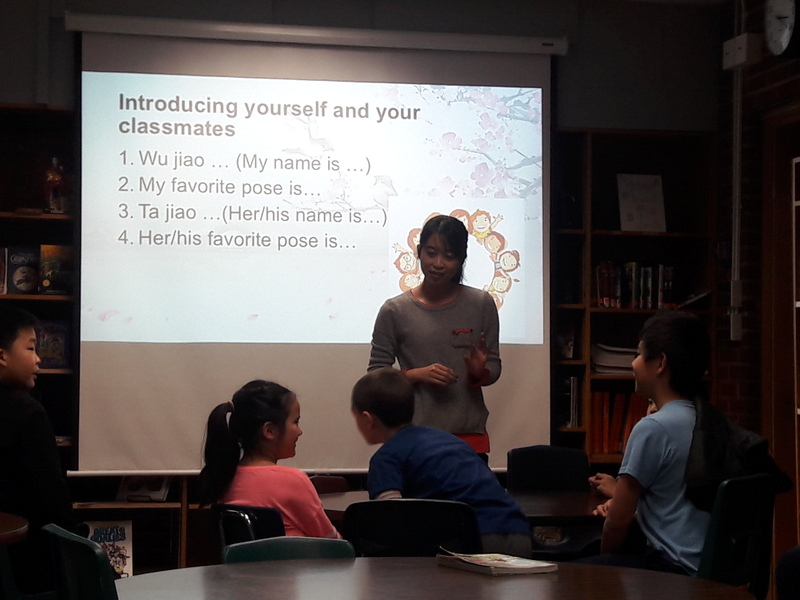 Students in the Chinese Club are combination of native and non-native speakers, so we have increased our attention on making a balance in teaching in order to have all the students to learn. We decided to separate the native and non-native speakers in our classroom, and classroom management is a big consideration that we face every week since the energy level of our class is really high. But I like to challenge myself and I believe that I can successfully deal with these 9 year olds. Yuxin (left) with LTS friend Ngan on the Oregon coast. For me, I think our 15-month program is really intensive. I can’t believe that I am almost done! But this intensive program also provides me an opportunity to prove that I can actually accomplish many things in a short time period! PS: Eugene’s summer is wonderful! 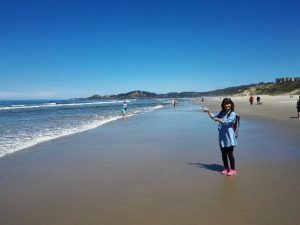 Please go to the Oregon coast! Thanks so much for taking the time for this interview! Hope you have a great end to the term.